Is there someone that can help me translate it to labview? 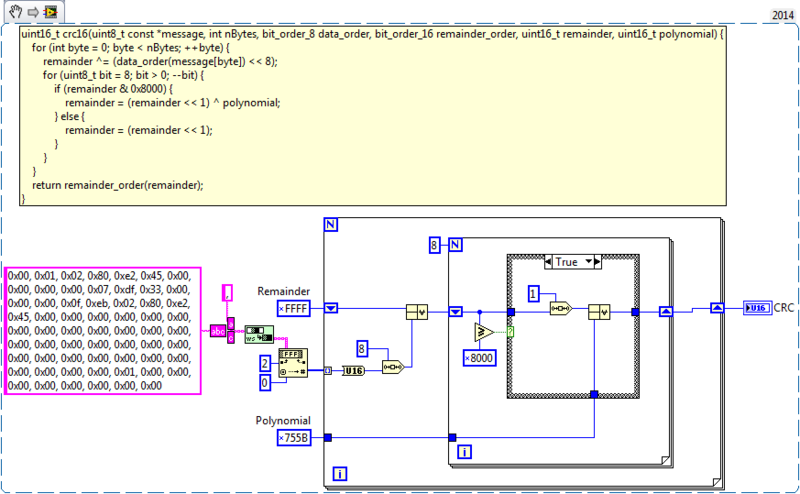 I would Google â€œCRC16 LabVIEWâ€ first, if I were you, and see if you can find it already done for you. If you can't give me some numbers I can put straight into LabVIEW, I'm not going to even try. You also haven't told us what the polynomial is so we don't know which flavour of CRC it actually is. Google should have told you that the code is 3/5ths of "this one"
Watch out for the OpenG trim whitespace! I don't see any issues with the algo at first glance. You did say it used bit reverse (the two other functions) and I don't see you doing that, however.